Every year for New Year’s Eve I make Buffalo wings, along with other yummy party food. We don’t really have a party so much as a quiet gathering of our little family, some treats, and a movie, then watching the ball drop. Buffalo wings are a must-have, though, and even my vegetarian daughter had “Buffalo tofu”. So, you can just sub tofu for the wings in this recipe, and it’s still delicious. This recipe also doubles quite well for a large group. This is a delicious gfcf, gluten free, family-friendly recipe! It can also be (if you double check ingredients!) a wheat free, dairy free, soy free, egg free, tree nut free, peanut free, fish free, shellfish free, and top 8 allergen free recipe. Preheat the oven to 400F. Lightly grease a glass 9×13 pan. In a gallon-size zip-top bag, combine flour through salt. Shake vigorously to make sure it’s well combined. Melt the butter in the microwave, then combine with the hot sauce in a large-mouthed measuring cup or bowl to facilitate dipping. Toss half the wings in the gallon zip-top bag, and shake until they are coated in the flour mixture. Shake off any extra flour, then dip each wing piece into the butter/hot sauce mixture, then lay onto the greased pan. Repeat until all wings are laid out into the pan. Bake at 400F for 40 minutes. We prefer not to turn halfway, as the chicken wings end up being crispy and spicy and perfect if they aren’t turned. Enjoy alone, with a blue cheese dressing, a ranch-style dressing, or just some cheese or milk/milk-substitute to cut the spiciness. 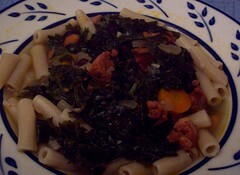 This is the first recipe to include dairy on this blog. My daughters passed a dairy challenge at the end of August, and our diet has started to include dairy. While most of the recipes on this site will still be dairy-free, an occasional recipe that includes dairy will appear, like this one. One day when I was trying to come up with something new to make for dinner, I had an idea to make a stuffing for the chicken. This turned out to be beautiful as well as delicious, and easy. This is a delicious gluten free, family-friendly recipe! It is also (if you double check ingredients!) a wheat free, soy free, egg free, tree nut free, peanut free, fish free, shellfish free, corn free, and low-carb recipe. This meal can be on the table in 45 minutes, making this a faux fast food recipe. Preheat oven to 350 and oil a 9×13 pan. 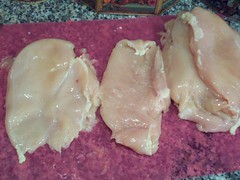 Separate the chicken breasts, then pound them flat one at a time. I have found it is best to place the chicken breast on a cutting board, place a layer of wax paper of plastic wrap on top, then use a mallet to pound the chicken flat. When pounding, you just want to get them flatter and thinner so they will roll well, don’t worry about making them perfectly thin. 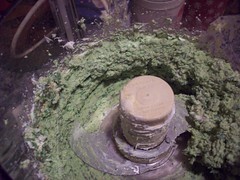 In a food processor combine cream cheese, gluten-free breadcrumbs, seasoning, garlic, and spinach. Pulse until the mixture is well combined and evenly green. 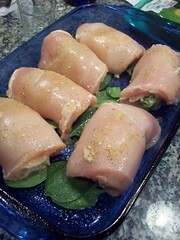 Optionally, sprinkle a few spinach leaves on the bottom of the oiled pan, place the chicken rolls on top of that. 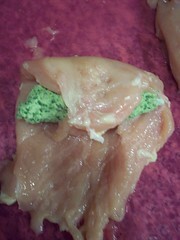 Spoon about 1/6th of the cream cheese mixture onto the middle of the chicken breast, then roll the chicken around it. Place the stuffed chicken breast in the pan, seam-side down. Repeat until all the chicken breasts are stuffed. Drizzle olive oil over the top of the chicken, then sprinkle a bit of kosher salt. A couple shakes of Italian seasoning on top looks nice, too. Bake at 350 for 20-30 minutes, until the chicken is cooked through. Serve with a roasted vegetable, some roasted potatoes, and then quickly sauté spinach in garlic & olive oil. 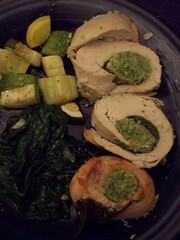 Plate with the chicken sliced into rounds on top of the spinach – a perfect, yet easy, meal for a dinner party! 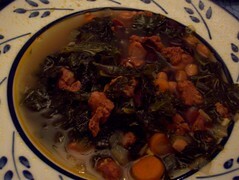 I recently made my Kale and Black Bean soup, and my step-father got very excited – apparently it tasted almost the way his father’s Linguiça and Kale soup had tasted. So, I listened to his suggestions, and ended up with this soup. I recently served this to several relatives at a family party, and they all loved it! Enjoy this hearty soup on a cold day, it will warm you up. It warms my heart along with my body – I see my family awash in memories, and my girls gobble it up. This is definitely approved by adults and kids! This is a delicious gfcf, gluten free, family-friendly recipe! It is also (if you double check ingredients!) a wheat free, dairy free, soy free, egg free, tree nut free, peanut free, fish free, shellfish free, low-carb, and top 8 allergen free. While the soup can simmer for a while, this can also be ready within 45 minutes, a faux fast food! Chop the onions, carrots, and garlic, and set aside. Slice the linguica in half length-wise, then slice in half again length-wise. Slice into quarter-moons about 1/2 inch thick. Bring olive oil up to medium heat in a large soup pot. Sauté the onion, carrots and garlic until tender. When the veggies start to get tender, add the linguiça. Let cook for a few minutes, until the linguiça starts to brown. 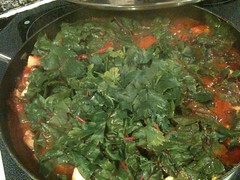 While the linguiça is cooking, prepare the kale. Rinse, peel from the hard stems, and rip into bite-sized chunks. Add to the soup pot and stir with tongs, it will cook down pretty quickly. 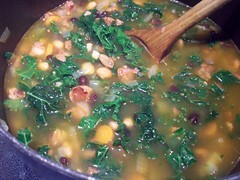 Once the kale has cooked down a bit, add the beans, seasonings, and broth/water. Turn heat up to high, and bring soup to a boil. Turn the heat down and let simmer for at least 10 minutes. If you want to add the optional potatoes or rice pasta, add them when the soup begins to simmer. Cook potatoes for 15 minutes, or pasta for amount of time suggested on the packaging. Serve alone or with a salad and rolls. Smile as you watch your family enjoy every last drop! For those who avoid pork, or who would prefer to eat chicken, this is an adaptation of my Sausage stuffed pork with apples recipe. This is incredibly easy, delicious, and can be on the table in 45 minutes. Serve with some quinoa, rice, or roasted potatoes and pair with roasted vegetables and/or a salad. This is a delicious gfcf, gluten free, family-friendly recipe! It is also (if you double check ingredients!) a wheat free, dairy free, soy free, egg free, tree nut free, peanut free, fish free, shellfish free, corn free, and top 8 allergen free recipe. Preheat oven to 350F. Oil a 9×13 or 9×11 baking pan (I line mine with Reynolds Release, which makes it much easier to clean up). Lay a chicken thigh in the pan, skinned side down. Squeeze part of the apple sausage from the casing onto the middle of the chicken thigh. Roll chicken around sausage, and set in pan. Repeat until you have used up all the chicken and sausage. Sprinkle the top of chicken rolls with a smidge of Tony Chacheres. Core the apple and slice it into thin slices. 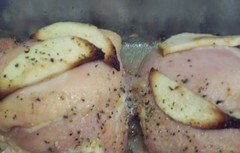 Lay the apples on top of the rolled chicken. Sprinkle a pinch of kosher salt on top, then slide into the oven. Bake for 30-45 minutes, until chicken and sausage are cooked thoroughly. This is one of my favorite ways to cook fish! I usually find fish somewhat intimidating, but this recipe is easy, delicious, and almost fool-proof. This was inspired by an early episode of Good Eats and Alton Brown’s recipe. I highly recommend picking up his newest book – Good Eats: The Early Years, even if you haven’t watched the show. It’s filled with a lot of great information, plus, he’s covered substituting for allergies on the show and he quite nice and friendly at booksignings. This is a delicious gfcf, gluten free, family-friendly recipe! It is also (if you double check ingredients!) a wheat free, dairy free, soy free, egg free, tree nut free, peanut free, shellfish free, and corn free recipe. 1 large or two small salmon fillets – with the skin on. We figure on about 1/3lb of fish per person, and I have made this with 8 oz of fish and also 2 lbs. The bigger issue is to make sure you have only 1 or 2 fillets to flip. In a cake pan or large, shallow bowl combine salt, pepper, and flour. Lightly dredge fish in flour and shake off excess. When pan is good and hot, add 1 tablespoon margarine (or a bit more olive oil) to the oil. As soon as it is melted, place fish in the pan, skin side down. For the first 10-15 seconds, shake the pan back and forth so the fish doesn’t stick to the pan. Cook until golden crust forms on the skin – about 2-3 minutes. Carefully flip the fish away from you and wiggle the pan again for the first few seconds. Cook until the meat turns golden brown and delicious. Remove from the heat and slide the fish onto a warm plate. Pour out the oil, add the 1 TBS reserved margarine (or oil). When the margarine has melted, add the capers and fry them quickly. After about one minute, take the pan off the heat, add the lemon juice to pan and mix together. Pour the caper and lemon sauce over the fish and serve. This is great and quick meal served with some quinoa or rice and then a roasted vegetable or salad. Yum! This is a recipe that popped into my head as I was wracking my brain trying to figure out what to serve for dinner. Finding new ways of making chicken is a pretty regular event around here, and I’m sure around many homes! This recipe is likely inspired by a meal I ate in a restaurant once, or one I saw on a menu. It’s delicious and easy, and definitely faux fast food – on your plate in under 45 minutes. This is a delicious gfcf, gluten free, family-friendly recipe! It is also (if you double check ingredients!) a wheat free, dairy free, soy free, egg free, tree nut free, peanut free, fish free, shellfish free, and top 8 allergen free recipe. Warm olive oil in a large skillet over medium heat. Add onion, and sauté until tender. Chop chicken into 1-2 inch pieces as the onion is cooking. Add chicken, garlic, oregano, salt, pepper, and basil to the pan, and sauté until the chicken is browned on all sides. This means using tongs to move the chicken, onion, garlic, and spices around the pan and rotate the chicken. While the chicken is browning, cut the artichoke hearts into quarters, chop the sprig of rosemary, slice the salami into strips, and roughly chop the roasted red pepper. Don’t forget to stir the chicken in between chopping! Add the rest of the ingredients, and stir until well combined. Continue cooking over medium heat until the newly-added ingreients are hot, and well-integrated. 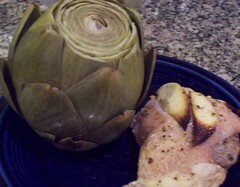 There will be some liquid in the pan from the artichokes (even after draining) and roasted red pepper. 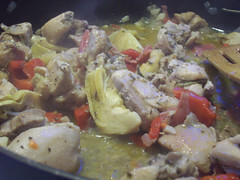 Some will evaporate while cooking, and the rest can be spooned over rice or pasta along with the chicken. Serve with rice or pasta (on the side or on top, depending on your tastes and the level of pickiness in your family) with a roasted vegetable or salad. This is a great crowd-pleaser, for adults and kids. Yum! 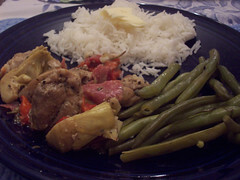 This is a rich and flavorful meal that has a hearty feel to it. 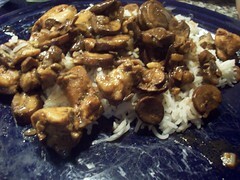 The combination of chicken meat, balsamic vinegar, and mushrooms leads to a wonderful depth of flavor and heartiness. A lighter meal with similar flavors is the Balsamic Chick Chick recipe, which pairs chicken with chick peas, plus the wonderful combination of balsamic vinegar and rosemary. This is a delicious gfcf, gluten free, family-friendly recipe! It is also (if you double check ingredients!) a wheat free, dairy free, soy free, egg free, tree nut free, peanut free, fish free, shellfish free, corn free, and top 8 allergen free recipe. This is also a faux fast food recipe, which can be on your table in under 45 minutes. Prepare seasonings, meat, and vegetables – mince, slice, and dice vegetables. Then cut chicken into approximately 1 inch cubes. Heat oil in a large skillet over medium heat. Add onion and garlic, and sauté onion and garlic until tender. Add chicken to the pan, and stir frequently. I find that a pair of Oxo Good Grips Tongs helps me keep the food moving so it doesn’t burn, and yet stir so the different ingredients are well combined. When the chicken has started browning, add the sliced mushrooms, rosemary, Italian seasoning, and kosher salt. 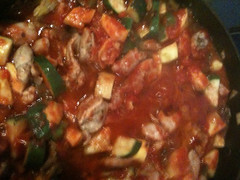 Continue to stir the chicken and veggies until the chicken is well browned and the mushrooms have shrunken and become quite tender. 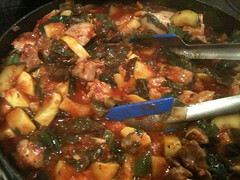 Drain any excess liquid from the pan after the chicken and mushrooms have cooked. 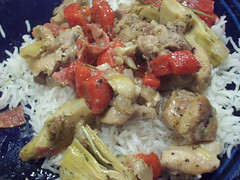 Pour the balsamic vinegar over the pan, and stir as it reduces and mixes together with the flavors already in the pan. 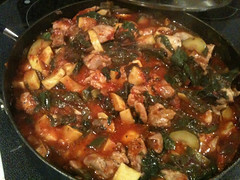 Remove the pan from the heat, and continue stirring so the ingredients are integrated into the whole dish. 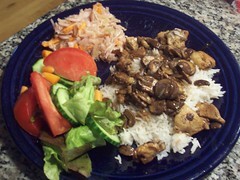 Serve over brown or white rice with a salad or roasted vegetables on the side. This is delicious!